OK, I admit that this recipe isn’t truly Spanish any more. It started out life as a Spanish walnut cake recipe that I came across in the early nineties, but it’s wandered a bit since then. As it happens, I could tell you an interesting story or two about a Spanish nut, but that was more than thirty years ago and I’m sure Carmen will have calmed down by now. I know I have. This cake is great with tea but, I think, goes even better with coffee. Or maybe even a small sherry. It will also work well as a dessert with a little dash or two of something creamy. Although the walnuts and pecans combine well in this cake, you could adjust the ratio and type of nuts as the mood takes you and, if you don’t have any Frangelico, feel free to substitute another liqueur or even a flavoured syrup. This cake is pretty filling so expect to get at least 12 slices unless you’re really hungry. Preheat oven to 180°C. Butter and line a 23cm round cake tin. Cream the butter and sugar together thoroughly. Beat in the egg yolks one at a time, followed by the flour and baking powder. Stir in the lemon zest, vanilla, Frangelico and the nuts. Whisk the egg whites to stiff peaks and fold in gently but thoroughly. Put the mixture into the prepared tin, level it out and bake for about 40 minutes. A knifepoint inserted into the cake should come out clean when it’s done. Allow to cool for about 10 minutes in the tin before turning out to cool completely on a rack. The other day, for some strange reason, I thought about Nathaniel Gubbins. I'd read some of his musings many years ago but it was obviously time for a return visit. Nathaniel Gubbins was an alias of Edward Spencer who was writing about food around the end of the 19th century. After a quick search I came up with probably his best known book 'Cakes and Ale'. This is probably one of the best-known British devilled sauces and I've seen it revived a number of times with or without variations. What I hadn't realised was that Mr Spencer intended this sauce to accompany 'legs and wings of fowl' at breakfast time. That’s a little early in the day for me, so I'd recommend serving it with grilled or simply-roasted chicken, turkey or pork for dinner. This time I used it with roasted pork fillet. Mr Spencer describes the sauce as 'invaluable, especially for the sluggard' – well, that’ll be me, then. This is not exactly the original recipe but it’s only slightly adapted. The amount given here should make enough sauce for 4 reasonably restrained people or 2 greedy lovers of devilled sauce. It’s pretty simple to put together but it’s best to not make it too far ahead of time. You’ll need a double boiler or a bowl suspended over barely simmering water. Melt the butter gently in the heated bowl. Stir in the mustard followed by the two vinegars. Once these are thoroughly combined, stir in the double cream. Season with salt, pepper and a little cayenne. Keep the sauce warm (but don’t let it get too hot) and pour over your chosen meat immediately before serving. Deeply old-fashioned and deeply delicious. Many cookbooks and TV cookery shows warn us that we must have recipes up our sleeves for the “Unexpected Guest”. I always imagine hordes of ravenous Unexpected Guests wandering the country looking for victims. So, if you’re troubled by the pesky Unexpected Guest, then this recipe could come in handy. Frankly, I should be ashamed of myself for even calling it a recipe. But since I have no pride and I currently have an infatuation for choccy philly (OK, Philadelphia with Cadbury, if I have to call it by its proper name) then I must point out that it makes a very pleasant and surprisingly healthy frozen yogurt. This probably isn’t the most refined chocolate ice you’ll ever have but it’s very moreish and really couldn’t be simpler. Whisk together the philly and the yogurt thoroughly. Whisk in the icing sugar, if you decide to use it. (The icing sugar isn’t essential but freezing seems to kill off sweetness, so I put a little back in.) Pour the mixture into an ice cream maker and churn in the usual way. If you store this in the freezer for any time, then it’s best taken out and allowed to soften a little before eating. Despite the fact that this is hardly a recipe at all, I’m submitting it to the May Bloggers Scream For Ice Cream challenge over at Kavey Eats. Now, you’ll have to excuse me, there’s someone at the door – I think it might be an Unexpected Guest or that annoying person from Porlock again. If you’ve read some of the previous entries in this blog, you may have noticed my interest in French cakes. Some of the recipes for these cakes have been difficult to track down and have needed a bit of research coupled with some trial and error. This is definitely not the case with this recipe. I first saw this recipe on Hervé’s excellent blog Les Ateliers d' Hys earlier this year. Since then I’ve seen the recipe turn up on more blogs than I’ve had hot dates – actually, a lot more. There are many variations on this recipe around now – savoury versions, fruity versions, gluten-free versions and Hervé himself has posted a chocolate version. I really can’t remember seeing any cake recipe have this kind of impact before. So I had to find out what the fuss was all about and make one for myself. The first thing to say is that it’s really easy and quick to put together – especially if you have a stand mixer. But, more importantly, it’s a superbly light cake with an excellent, tasty crust. It’s a little like a Gâteau de Savoie but with extra flavour and richness from the butter. Great as an afternoon treat but also excellent as a dessert with fruit and something creamy. I used Hervé’s original recipe, which you can find here. I cut down on the amount of sugar, which he suggests is an option, and I used a 20 cm tin. In my oven, it definitely needed to be covered part way through baking to prevent excessive browning. Incidentally, since I also wanted to make a large batch of meringues, I used a pack of chilled egg white for this recipe rather than have a lot of egg yolks hanging around. I'd never used the product before but I'm happy to report that it works very well - I don't know why I had any doubts, really. 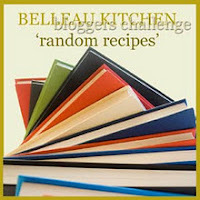 I’m linking this up to the May Bookmarked Recipes event created by Ruth from Ruth's Kitchen Experiments and hosted by Jacqueline over at Tinned Tomatoes. Although it was bookmarked from Les Ateliers d' Hys, I reckon that I could have actually bookmarked a version from at least 30 other blogs. It’s good to see a little cake doing so well for itself in the big wide world.